Taken from the 50th Anniversary book produced in 2001 ………. 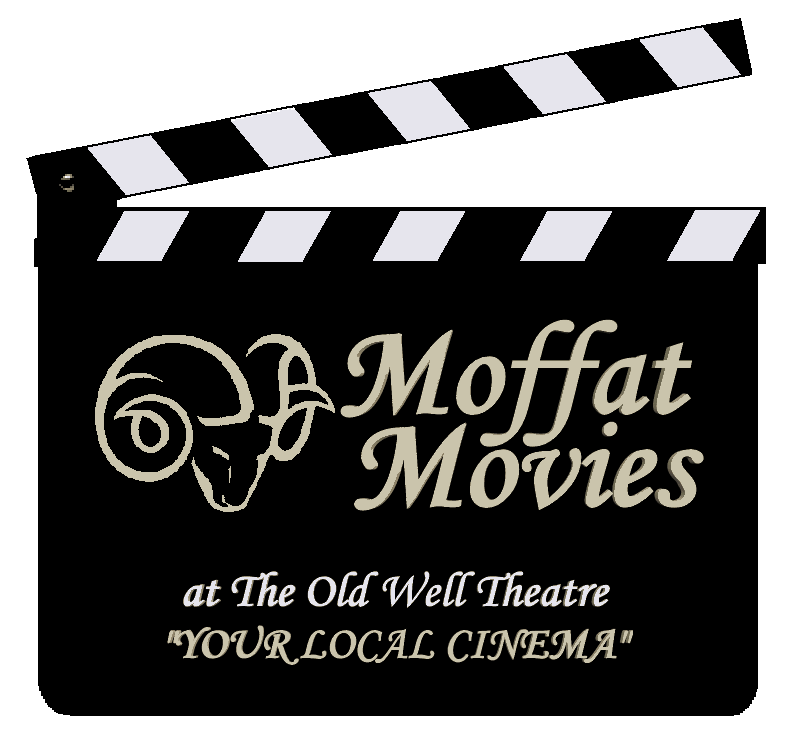 In the autumn of 1951, a small group of young people decide it was time that Moffat had an amateur dramatic society again. (An earlier one had been formed in the town during the 1920’s). One member of the group, Mary Cooper, had recently been touring village halls in the Highlands with the Perth Theatre Company, and it was felt that this experience would be sufficient to overcxome any obstacles that living in a climate of post-war austerity might throw up to hinder the project. 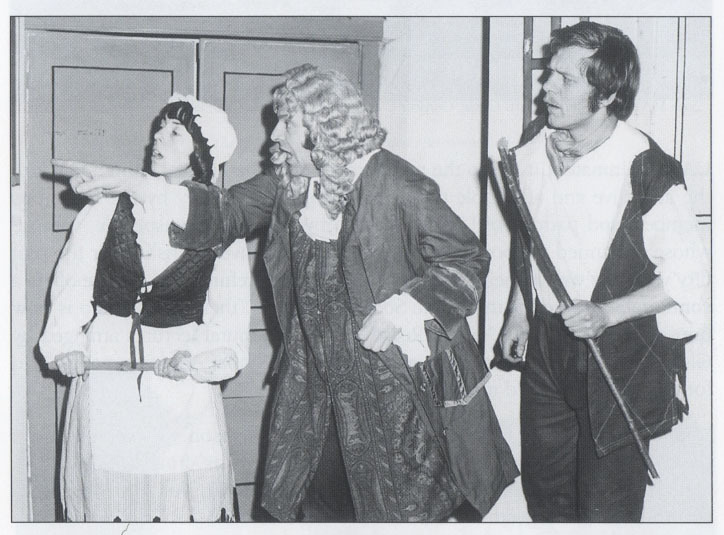 With no premises, no finance, and very little experience of running an amateur dramatic society, the group set to and produced – in halls that were kind enough to accommodate them – two one-act plays. Then, with some trepidation and great daring, the “Baths Hall” (not Moffat Town Hall) was booked, and Upper Annandale Dramatic Society prepared to put on its first three-act play, Edward Percy and Reginald Denham’s “Ladies in Retirement” during the spring of 1952. 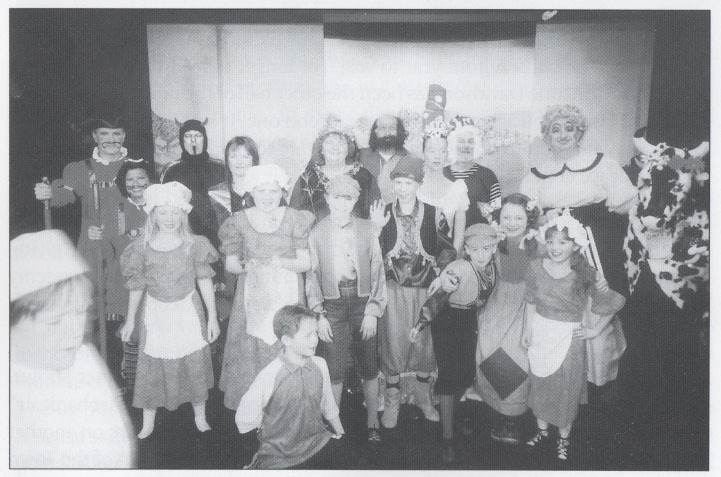 One man was needed to complete the cast, so some months before the production was due to be staged two talent spotters, Mary Cooper and Mary Tweedie, had attended a performance of Moffat Youth Club’s pantomime at the Academy. They were particularly impressed by one cast member, who they waylaid in the school corridor after the final curtain. This young man had originally gone along to the Youth Club to play badminton, and and had only been persuaded to appear in the pantomime when one of the actors failed to turn up, Fortunately, the youthful John Murray also agreed to take part in the forthcoming UADS production and rehearsal began after Christmas. John vividly recalls the overwhelming experience, for him, of playing this role, so different from his own character, the satisfaction of rehearsing, portraying dramatically the words and emotions of the ingratiated Albert, and performing in from of an audience who had paid for seats, in the Town Hall. From that time he was “hooked”, and his devotion to drama, and to the theatre, has formed a major part of his life – and, half a centry later, continues to do so. An appeal for new members was made in a curtain speech given after the performance, and such was the level of response that another production – “And So To Bed” – was planned for the autumn. 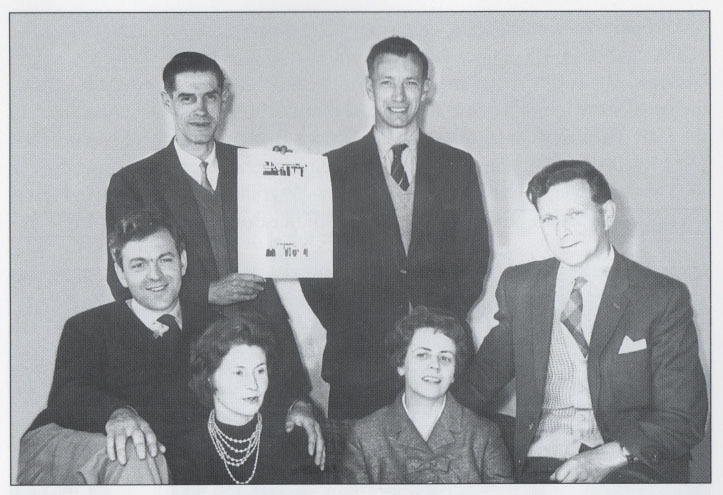 A simple constitution was drawn up, a small management committee appointed, and UADS was officially here to stay – and for the next fifty years! The fledgling Society aimed to produce two plays a year. Members rehearsed in one another’s houses, constructed sets as and where they could, and set the stage for the one dress rehearsal (in the Town Hall) the evening before the performance. The set was struck as soon as the audience had departed after the final curtain. Moffat’s earlier dramatic society had bequeathed some stage flats and lighting equipment, which can still be fojnd in the flats store in the Old Well Theatre. In fact, the set for “Ladies in Retirement” was painted on paper and subsequently attached to the flats. Mary Cooper recalls the hours of work spent creating the sets and rehearsing for the single performance. 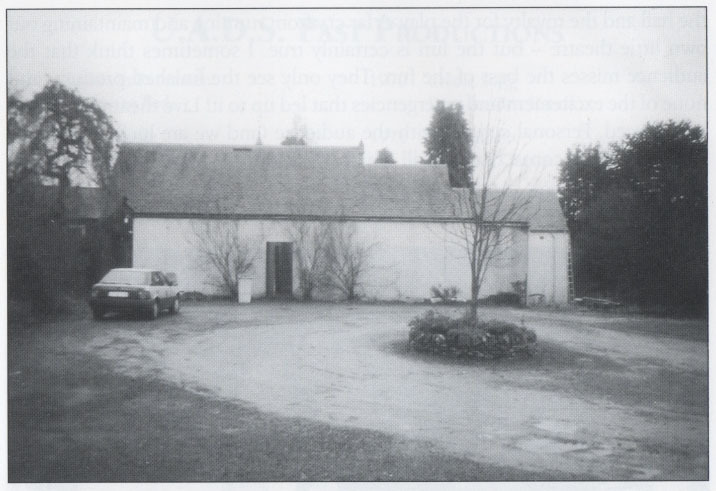 Alternative rehearsal rooms were eventually found in the now demolished Legion Hut in Well Road, and in unfurnished rooms at the back of the Manse at Kirkpatrick Juxta. Later, the Society rented the top floor of what was then the Co-op furniture store in Well Street (later the Antique Shop). One of the important productions at that time was “The Little Foxes” followed by “Blithe Spirit”. It was during rehearsals for “Blithe Spirit” up in “the Gods”, as their rehearsal room was known, that several members of the cast were taken ill with headaches and nausea, (alarmingly, one person passed out). It was discovered that a faulty gas boiler was emitting carbon monoxide fumes! Undettered “Blithe Spirit” went ahead. Not surprisingly, Noel Coward’s play is a regular favourite with amateur dramatic societies everywhere. There isn’t a bad part in it (even the maid is a good part) and the hearty medium Madame Arcati allows for some very imaginative performances indeed. The Society bravely went on tour in the fifties, with its members taking culture and laughter to the outposts of Annandale and Eskdale, and ventured across the border to Carlisle, playing in a variety of church halls. 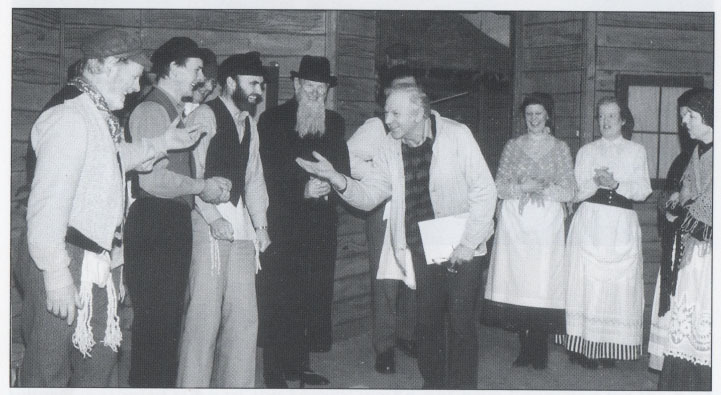 There was also a memorable visit to Kirtlebridge, when the actors performing “Waters of the Moon” were obliged to wait outside the hall door in near zero temperatures as they strained to hear their cues. In fact, anecdotes abound from the touring season. For example, the riotous laughter that erupted in the audience when, during a performance of “And So to Bed” at Johnstonebridge, King Charles II kissed the leading lady and transferred his moustache – comprising only greasepaint, to the lady’s cheek! On the way to Wamphray the wishing-well, an essential prop for “Sunday – costs Five Pesos”, fell off the lorry never to be seen again. (A local joiner hastily rigged up some pieces of wood and a car starting-handle in its place). Difficulties were experienced in getting the Society’s 9-foot flats onto makeshift hall stages; entrances wee made by climbing over beds, and there was hilarity in Eskdalemuir when it was discovered that the only way to have any scenery at all was to set the flats horizontally! Not least there was the case of mistaken identity in Lanark resulting from an eruption of the actors’ pent-up irritation as a stream of patrons crossed the dressing-room en route to the toilets. “Surely there must be another toilet you can use”, one actor exploded. Ominously, the gentleman accosted announced – “I am your electrician”. Needless to say, the lighting effects ere less than perfect that evening. 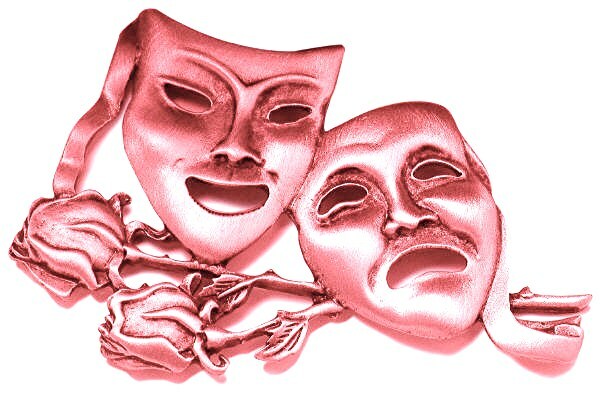 Two years after coming into existence, UADS entered its first Scottish Community Drama Association Festival (held in Dumfries) with “A Tail of Fire”, in which members competed with older established drama groups from Eskdalemuir, Annan and Thornhill. Later, the Society won the regional area round of the SCDA, and took A. J. Talbot’s “One Evening at Nero’s” to the Lyric Theatre in Glasgow. The set, with its “marble” columns and “tilesd” floor, which had filled the small stage in the Town Hall, seemed diminutive in the vast acting arena in the Lyric Theatre! Worse still, stage regulations demanded that all sets must be fireproofed, entailing vigorous flame proofing over the cardboard set by the theatre technicians. The result was limp, sagging pillars framing Nero’s Palace, with the cast praying that their scenery would last out the performance. 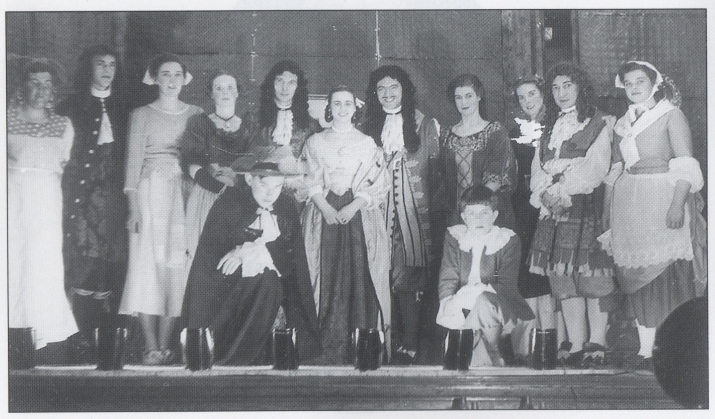 By this time, with interest being predominately in three-act plays, the Society became a courtesy member of the Cumberland Drama League (which held a three-act festival) and in 1967 won the drama festival with its production of Sylvia Rayman’s “Time To Speak” – Marion Murray and Sam McVie being named as “Best Actress” and “Actor” in the festival. The previous year, Marion Murray had achieved tge “Best Actress” award for her performance in “The Heiress” and Betty Alexabder the “Best Supporting Actress”. 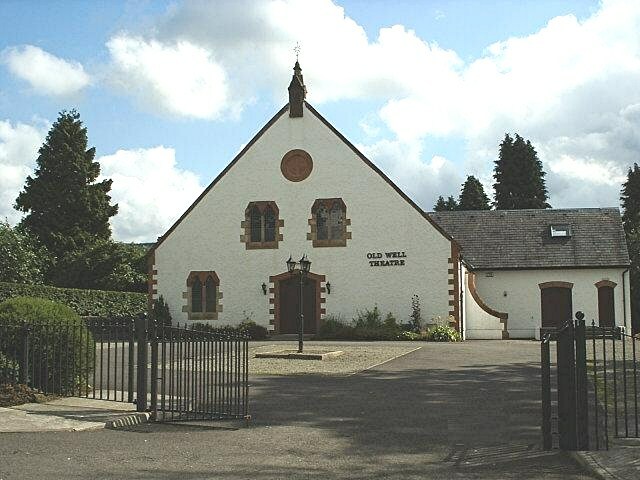 During the 1960’s, the hall to the rear of the church in Old Well Road (then used as a grain store) was made available both for rehearsals, and as it already had a small stage, for performances. The church was demolished in 1967, but the Society stepped in and purchased the hall (which was also due to be knocked down) for two hundred pounds. Two years later, following restoration of the roof and the installion of water, the hall was transformed into the Old Well Theatre and became “home” to the Society. (If anyone knows what happened to the original lighting equipment, props and stage-cloths that were left in the hall during refurbishment, and not there when UADS took it over in 1969, members would be very please to hear from them). The first performance to be given in the hall was “The Heiress” at which Maurice Lindsay, then of Border Television, was present. Other innovations in the annual programme have included summer shows. One year, for example, UADS gave an open=air performance of the “Mechanicals” from “A Midsummer Night’s Dream” in the Station Park, for the Gala; on another occasion “Stew for Simon” was performed on the platform in front of the Town Hall. 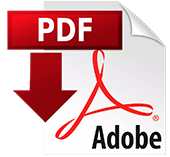 Another project (launched in 1971) which has become an annual event is the Art Exhibition. Every year a wide range of local talent in art and craft work is on display, including wood-turning, weaving, pottery and jewellery-making. Over the years, a very comprehensive wardrobe has been built up, resulting from donations, bargains in charity shops, and the skilled efforts of the Society’s costume designers and needle-women. There have been only two productions over the past fifty years for which costumes were hired. Small alterations and improvements were made to the Old Well Theatre from time to time, as and when funds allowed. Perhaps the most significant of these, both for the actors and audience, was the removal of the raised stage, giving ther actors the freedom of a flat acting area. Raked seating was installed just before the production of “School of Wives” in 1977. However, a chance encounter in 1996 with the newly formed National Lottery Fund, when that organization booked the theatre to encourage applications from groups in south-west Scotland, proved to be something of a milestone for UADS. Ultimately, it led to the transformation of the original church hall into the attractive and adaptable theatre now enjoyed not only by the numerous members patrons of UADS, but also by the local townspeople, without whose continued support the Society would not have flourished for the past fifty years. As well as being “home” to UADS, the refurbished theatre offers a comfortable venue for the Music Society meetings (their grand piano is now housed in the upstairs “Green Room”); for extra-mural lectures arranged by Glasgow University; for theatre workshops with Moffat Academy pupils, and for the recently formed monthly Film Club.